Can a toddler sleep in a toddler bunk bed? The answer depends on how big your toddler is, how agile he is, and how comfortable he is navigating heights. A one year old should always be on a bed close to the ground; a two year old almost always. A bunk bed may be appropriate for an agile, well-balanced three year old, or for a normal four or five year old. What kind of bunk bed should you buy? Typically bunk beds are not available in ‘toddler bed’ size (to fit a crib mattress); this makes sense because , since you are buying them for larger, longer, toddlers, you’ll want them to fit a bit longer. 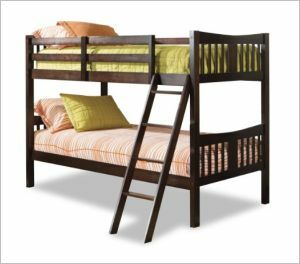 You can find some bunk beds that are not as tall as the standard, and these are more ideal for little people. A bunk bed can either be used to sleep two children, one above and one below, or you can have your child sleep on the top bunk and use the second bunk as a kind of day bed, a cozy place to play house, or a place to cuddle up with mom and dad and read stories. Some bunk beds—usually the more expensive ones—come with a tent on the lower story; but of course, your child can always improvise with sheets and blankets even if you’ve just bought him a standard bunk bed for kids. If you’d like a wooden toddler bunk bed for your growing toddler, one nice basic option is the Stork Craft Caribou Bunk Bed in Espresso. This bunk bed is a little lower to the ground than other bunk beds, which makes it a little safer for your smaller child. Made of sturdy wood, it has a outdoorsy feel to it—without compromising on a finished look. There is a ladder going to the top, and the upper bunk has a 12” rail to keep your child in his place at night. One nice thing about this bunkbed is that it can be converted to two twin beds if, after a trial, you discover your child really isn’t ready to sleep all that high. Would you like a little more room on the bottom bunk, perhaps for an older child or perhaps just for extensive relax-and-read-story space for you and your little one? 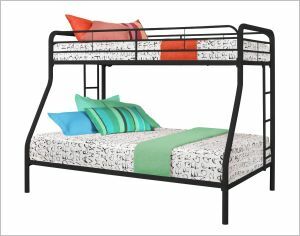 The Dorel Home Products Twin over Full Bunk Bed is a metal framed bed that takes a twin mattress on the top and a full sized mattress underneath. There are rails all around the upper bunk, so no midnight sleep-rolling, and the bottom should be low enough to the ground that any rolling off won’t result in calamity. 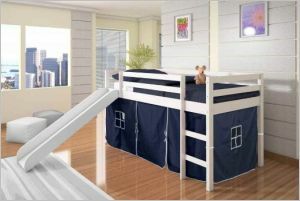 If you’ve only got one child who will be using the toddler bunk bed you might want to get something without a bottom bed at all; your toddler isn’t ready for desks and file drawers yet, so let him have a tent at the bottom, and a slide that enables him to slide out bed to breakfast is a pretty cool add-on. The Donco Twin Loft Bed is a high-quality pine bed made in this style. Assembly may be a headache, but once you’ve got the pieces together, you’ve got a beautiful bed your child will love sleeping in—and love climbing out of in the morning. There are side rails to keep your child safe, and remind him to stay in his place for the night. The white finish will fit well with any home décor, and there are five color options for the tent underneath. Three very different bunk beds that can be used with toddlers—which is your style?